The ‘Typhonian Tradition’ is generally supposed to refer to the legacy of writings bequeathed us by the writer Kenneth Grant. Grant undoubtedly considered that he was the chief emissary of the dark cult alluded to by HP Lovecraft. The task of liberating the elder ‘priest’ Cthulhu, or Thelema—“when the times are right”—falls to those who pledge themselves to the Great Work of liberating souls from the artificial hell world created by human beings and their gods of religion and scientism. Aleister Crowley claimed, in his notes to his book Magick, to have revived the ancient Sumerian magical tradition. Others might say that while he made a useful start on this, he did not go far enough. According to the Typhonian writings of Grant, Crowley was too solar, too positive and masculinist to really grasp the lunar-feminine mysteries of Set-Typhon that lurk behind the barbaric words of the (Egyptian) Book of the Law. 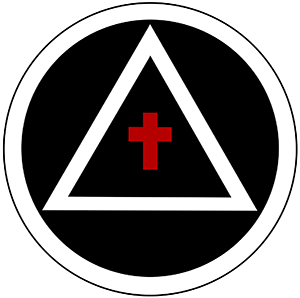 Other Typhonian cults of Thelema since the time of Crowley and Grant have continued to develop elder magick in their own ways. Some have gone so far as to clear out the monotheist mantrams from the Qabalah and have reinstated the central role of the pre-religious Creatrix that was demonised and banished from the Tree of Life during the previous precessional ages of Pisces and Aries. For example, the Order of the O∴A∴ has revised the Qabalistic names of the Tree of Life and removed the formulaic biblical demiurge Tetragrammaton from its rituals. An ‘unknown language’ called Enochian, said to have been taught to Adam in primordial times, is used to sound the rituals of the pentagram. Instead of the Judaeo-Christian angels that are traditionally placed at the four quarters of the ritual circle, there are evoked the ancient forms of the starry goddess, Ishtar (or Lilith), Babalon-Qutesh, Ashtaroth and Isis. Adapted from Dreaming Thelema of Kenneth Grant and H.P. Lovecraft, by Oliver St. John [Tantrika Books]. There is wide interpretation of left hand path and right hand path even in India and Tibet, where the terms originated. The way of the left hand (vama marga) generally denotes a path of knowledge where ritual and yoga is rendered effective and meaningful through devotion to the shakti or feminine power. Devotio n to the shakti, and any spiritual path inclusive of sensory pleasure, is most often associated with tantra, though tantra only denotes method or practice (literally, ‘to weave’). 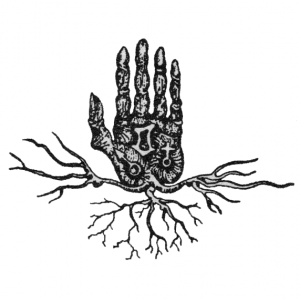 The right hand way (dakshina) aspires to truth and purity (of mind) and is often associated with asceticism. Nonetheless, tantra or the left hand path may well include practices considered by the average person to be ascetic, since nothing is achieved without discipline. And likewise, the way of the right hand path may sometimes include heterodox methodology. Notably, the sage Ramakrishna never used the terms ‘left hand path’, ‘right hand path’. He practiced celibacy, through personal inclination, yet there is no evidence that he recommended this to his disciples as rule of thumb. While he wryly denounced those who merely desire sensual gratification, or that lust after ‘gold’ and temporal power, recorded anecdotes reveal that Ramakrishna was not at all orthodox. Indeed, he saw any dogmatic approach to God or religion as the consequence of ignorance and egotism. In the West, the misappropriation of these terms over the last century or so has resulted in confusion. Thus the left hand path is commonly thought to refer to black or ‘evil’ practices. The way of the right hand is associated with religious asceticism, repression and moral hypocrisy, especially by those for whom the term ‘left hand path’ is a means of self-identification. Aleister Crowley rejected the left hand path in his writings yet has frequently been accused of advocating the same. Dion Fortune followed suit, yet would have been scandalised if she had not kept some of her practices secret even among her adepts. The confusion deepens when it is considered there are many followers of Crowley who proclaim they practice the left hand path, while those who continue the legacy of Fortune would have us know they are chaste adherents of the right hand path. Whether left or right, tantrik or ascetic, it seems to be the case that while adepts are willing to undergo rigorous self-discipline, this is not so with the more vociferous outer court followers of various traditions. The revival of popular interest in magick and the occult that gathered momentum in Europe and America from the 1950s through to the late 1980s emerged, after all, from a burgeoning beatnik subculture. Thelema sprang directly from the ancient Egyptian starry wisdom cult of Thebes, from whence the oracular voices that sprang from the Stele of Revealing in Cairo, 1904. We shall therefore examine the left and right of the magick of old Egypt. The left hand path is frequently identified with heterodox practices that are sometimes condemned as immoral. We shall begin, therefore, with the Egyptian festival of the goddess Bastet, which outsiders deemed lewd. Round about the tower is a wall, engraved with hieroglyphics and depictions of various beasts. The inner temple is enclosed by a high grove of cultivated trees, and in it is set up an image. The length of the temple is 220 yards each way. From the entrance of the temple Eastward, there is a fairly large causeway leading to the house of Hermes, 660 yards long and four acres broad, all of good stone. It is bordered on each side with tall trees. Herodotus describes a processional route. The shrine containing the image of the solar-venusian Bast would be taken to the temple of Tahuti (or Thoth), which Herodotus identifies with the Greek god Hermes. A brief Qabalistic digression is necessary. Venus is the ruler of Taurus while Hermes-Mercury is Lord of Gemini. 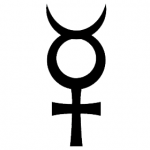 The glyph of Mercury is threefold, combining the symbols of both the Moon and Venus in one. Thus it is said of Hermes that he is ‘thrice greatest’, Trismegistus. The Moon, Mercury and Venus form the lowest triad on the Tree of Life, oft associated with the astral plane or Yetzirah. It is through this lower triad that the starry wisdom is communicated to the human mind. We shall see later how the spiritual fact concerning this function was told and retold in various myths, including the biblical one of how the Nephalim, a race of ‘giants’, were said to have been the progeny of angels who fell from the stars to mate with the daughters of earth and teach them magick and science. The festivities on the Nile route to Bubastis took place on a grand scale. Celebrants were carried there in boats along the Nile. According to Herodotus they numbered 7000 men and women, for children were excluded. The reasons for the exclusion become apparent when it is described how Egyptian women would beat loudly upon drums, while others would shout ribald insults at the townsfolk that had gathered to watch from the river banks. Others among them would lift up their clothing, showing themselves naked. All of this was carried out in high spirits and good humour. Once the celebrants arrived at Bubastis, the multitude set to the devotional rites with great solemnity. Lavish offerings were made, including costly grape wine, which was rather more than the average farm worker could afford in those times. In spite of the renowned Egyptian ribaldry and sense of fun, commentators thought the festivals to be ‘licentious’. When religion superseded the old ways, prurient zealots found such festivities so abominable that they succeeded in getting them abolished altogether. The feline Bast and lioness Sekhet were representative of Lower and Upper Egypt respectively. The ancient ways of the bestial goddess, a sexually ambivalent creature of the night, exemplify the left hand path. The cat goddess Bast was frequently identified with Buto, the oracular cobra serpent. The famous Delphic oracle was the later Greek edition of ancient Egyptian methods of obtaining an oracle through the mediumship of priestesses possessing secret knowledge of the snake. In the context of the 17th path of Gemini, the Children of the Voice, the sacred vibration of the priestess is sent forth from Chokmah and Binah above the Abyss to inform the Intelligence of the Heart in Tiphereth. In countless Egyptian hieroglyphics, cat or lion-headed deities are twinned, most notably in the aker or ‘lion-gate’. The gate is variously representative of the two ends of the year (equinoxes) or the entrance to and from the Egyptian underworld or duat. The Egyptian hieroglyph for the sky has two peaks or horizons pointing upwards to show the day. When the peaks are pointing downward, it is a depiction of the night sky. In the underworld, everything is mirrored and in some cases even shown upside down or averse. a) The upper section of the artefact depicts souls travelling to the Great Neter who looks both ways (i.e., to the East and West horizons, yesterday and tomorrow). b) The middle section portrays the four Apes who steer the sun boat of Ra. They are shown in their cosmic form, as star gods, and are generally associated with fire. They are paying homage to a dual figure of the ram-headed god of Mendes, otherwise Amen-Ra, who has four faces and an ornate crown. On each side, Amen-Ra bears a threefold sceptre combining the Set-headed (was) sceptre of power, the Ankh of Life and Djed pillar of Mendes. The Djed is similar in meaning to the path of Samekh on the middle pillar of the Tree of Life, and symbolises the spinal column as the passage for the inner fire of the soul. The cross ‘x’ is to show the threshold that must be passed by the Initiate. c) The lower section is an inverse mirror for the constellations of heaven, as shown by the totem form of the sky-goddess Hathoor. This is the dreaming world or subconscious. Notably, the seated god with a bird’s tail feathers, and the serpent, are ithyphallic. Both male and female become tumescent when dreaming at night, as was well known to the ancients. Dreaming is the principle power of the gods. All power has been transferred to the underworld region (left hand, left eye). Now ye shall know that the chosen priest and apostle of infinite space is the prince-priest the Beast; and in his woman called the Scarlet Woman is all power given. That which is below is like unto that which is above, and that which is above corresponds to that which is below, to accomplish the miracle of the one essence … Its father is the sun, its mother the moon. The wind carried it in its womb, from the bosom of the earth it is nourished. It is the source of all works of wonder in the world. Its power is complete. The flow of consciousness involves both projection and radiance (sun, the right eye) and absorption and reflection (moon, the left eye). The primary dual power of consciousness is objectivity and subjectivity. The goal of yoga is to achieve transcendence through uniting subject with object. Thus, the eye is made ‘single’. The way of knowledge (ynana yoga) is typified by the path of Gemini, to which is ascribed the letter zayin, the sword of division. Union, on the other hand, comes through the love of Nuit or Venus, which is the governance of Taurus, the Magus of the Eternal. As we shall see, love under will or Thelema (Logos-Agape) is aptly imaged forth in nature and mythology by the constellation of Orion, which spans Taurus and Gemini, or Isis and the word of Thoth. 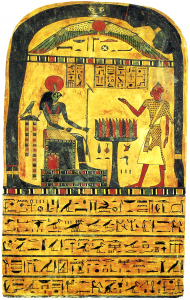 On the front side of the Stele of Revealing, the adorant Ankh-af-na-khonsu mirrors the god Mentu, who embodies both Ra and Set-Typhon. The Theban priest is called ‘Khonsu’ (sky-traveller) after the moon god. 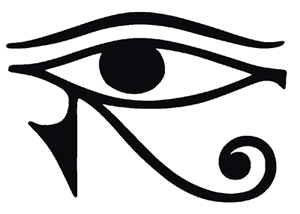 At Thebes, Khonsu is the child of Mut and Amen-Ra. The priest makes the gesture of invocation and offering with his right hand, as he wishes to offer the god all that he is and can ever be, his whole self. The right hand is giving, as the sun gives light and life to the world. As the right hand is giving, the left hand receives. We cannot have one without the other. The act of giving contains receiving latent within it. The act of receiving has the seed of giving, latent. A true invocation is at the same time an offering, for only the whole self is a fit offering to the gods. Egyptian gods and priests are frequently depicted with their left foot forward. The constellation of Orion the Hunter, known as Sah to the Egyptians, has his left foot forward in the sky. Orion is close to the constellations of Taurus and Gemini, and was known to the Babylonians as a herald or messenger as well as the guardian of land and boundaries. Orion is variously depicted as a god, giant, shepherd, walking bird or phoenix. The magical race of Nephalim mentioned in the biblical book of Genesis 6: 1–4 were in all probability children of Orion (Aramaic Niphelah). The mysterious genealogy is explained by Sumerian myths, which tell of wise Akkadians that survived the flood, or otherwise came ‘out of the sea’ (viz., the depths of inner space). Whether gods, demigods or priests of the Mercurial deep-sea god Enki, the Akkadians taught knowledge of science and magick to generations of humans after the last great cataclysm on earth. The knowledge is that of the Ancient Ones, who before the flood, set in place gigantic and mind-bewildering artefacts in various earth locations, for which there is no exoteric explanation. Some of these locations are subterranean, of which a most notable example is the catacombs below what is called the Saqqara complex in Egypt. The star that marks the left foot of Orion is Rigel, positioned at 17 degrees Gemini. Rigel is the brightest star in Orion and one of the seven brightest stars in the night sky. Rigel was very important in the ancient Egyptian scheme of things as it rises before Sirius, the heliacal rising of which marked the solar year. Pharaohs and priest-kings take the form of Sah (sahu) upon death. The constellation is thus associated with resurrection and immortality. By the Qabalistic method where chapter and verse numbers may be compounded, the verse equals 13, path of the Priestess of the Silver Star. The star is also a moon, for Da’ath is the ‘height’, the summit. The ‘higher moon’ is located at the outer threshold of the planetary system glyphed by the lower sephiroth. Da’ath is best understood as the apex of a tetrahedronal pyramid, of which the first three numbers form the base. At the summit, all ways meet. The left hand path and right hand path then cease to have meaning, as do all other conventions. The intimacy of lunar and stellar relationships may easily be demonstrated Qabalistically. By conventional numeric values, IA ChNSV (sky-traveller the moon) yields 375. Dividing 375 by its factor of 5 (number of the ‘star’) results in 75, the number of NVIT. Thus the priest of Thelema is as the moon or sky-traveller. 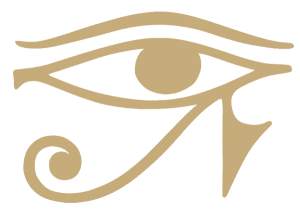 His star is that of Nuit, to whom he is guided through reflecting the radiance of Ra the sun god. Is the Left Hand Path the Right Way to Follow? In India and Tibet there has ever been a guru tradition. Initiation, if it comes, is passed directly from master to pupil. Sometimes the right way is left and the left way is right—it all depends, for the meaning differs according to the school of thought and the individual. While there does not appear to have been a guru tradition as such in ancient Egypt, the schools of thought (and so practices) were as diverse and numerous as the nome or earth locations down the length of the Nile. Likewise, individual teachers and practitioners could be counted as reeds strewn upon the surface of that great river, or as stars in the night sky. While it may be convenient to classify all magical and spiritual practices as either ‘left hand path’ or ‘right hand path’, we must consider whether such arbitrary divisions draw us nearer to truth or lead us further away from it. Or perhaps even that—as is now the case in the technological age—such simplistic devices might blind us to the possibility that truth can even exist. There is a modern development of the left hand path that is a far cry from the festivities of ancient Bubastis. Rational scientism has exerted its influence on esotericism to the extent that some will, in all sincerity, assert that nothing exists beyond the self. All else, they will say, is ‘impermanence’, nothing but dream. Such atomistic cults—for they posit a unitary intelligence as sole reality—invert the principle of Buddhist impermanence and at the same time translate the ‘one God’ of monotheism into a ‘Dark Lord’. In that, they hope to find an amplification of personal power as a means of gaining unlimited self-gratification. There is nothing very new about that. The technological, industrially driven age we have entered is fuelled by greed and selfishness. As a consequence, despair, alienation or otherwise sheer indifference is now commonplace. Amidst such a spiritual vacuum it should come as no surprise that some would worship at the altar of a tyrannical overlord whose monstrous, mocking image reflects the wish of that which Freud termed, the ‘infantile ego’. 1. See The Gospel of Sri Ramakrishna, translated by Swami Nikhilananda [Ramakrishna-Vivekananda Centre, New York, 1942]. In relation to Tantra, which Ramakrishna mastered quite early in his life, see pp. 20–22. 2. See Magick Without Tears, Aleister Crowley. 4. Gods of the Egyptians Volume 1, pp. 449. 5. Aleister Crowley, The Equinox Volume 1, No. 5, pp. 89, ‘The Temple of Solomon the King’. The insight was that of Frater Achad (Stansfeld Jones). © Oliver St. John 2018. This is an abridgement of an essay from the book, Babalon Unveiled! Thelemic Monographs [Ordo Astri]. Why is the Pentagram upside-down? Subscribe to our monthly Journal, The 93 Current. The Journal is free of charge and is delivered by email. There is very little in historical records concerning the nature of the god Set. Light research will reveal little other than the legendary battles between Set and Horus. The battles owe to middle and late dynastic times, by which time Set had become thoroughly demonised. The ‘Sethian Gnosis’ forms part of the collection of works attributed to Hermes Trismegistus. 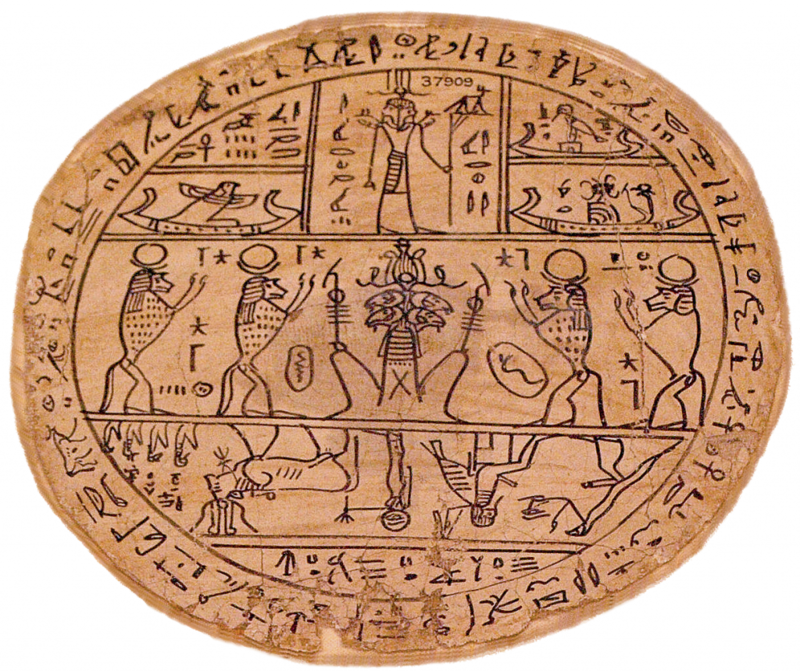 There we find what is very likely a pre-dynastic ancient Egyptian cosmological trinity. The principles of light and darkness are permeated by spirit or fragrance, forming the matrix for manifestation. The trinity is the geometric expression of Set or Saturn, the basis of form as an idea on the spiritual plane. Qabalistically, the three veils of the limitless, Ain Soph Aur, are projected through Da’ath (Set-Hadit) to form the triangular basis of the Tree of Life, or of Eternity. The mysteries of Set were resumed, in fragmentary form, in other Gnostic scriptures. In Pistis Sophia, the name of Jesus is said to be ABERAMENTHO. While Christian theology insists the name ‘Jesus’ to be that of a historical personage, the Graeco Egyptian name clearly means, ‘image (likeness) of Ra-Mentu’. The god Mentu combines the attributes of both the solar Ra and the lunar Set. ABERAMENTHOOO thus identifies the Gnostic Christ with Set-Typhon as the Initiator. The Coptic name, which begins with alpha and ends with omega, adds Qabalistically to the number 1013. There is more to ‘likeness’ than mere similarity, for the number 1013 is that of syzygy, a word indicative of a method by which one knows oneself ‘through another’. The polar twin or double is central to the elemental magick of the ancient Egyptian priesthood of Set. The surviving fragments of this knowledge were attributed to the Greek god Hermes (Roman Mercury) to obscure the fact that it was derived from Egypt, the ‘black land’ of Khem-mentu. Mentu is the name of the god that appears on the obverse of the Stele of Revealing. He has various names, including Horakhty, the Sphinx who is ‘Horus in the Horizon’, and Ra Hoor Khuit, which is the longer form of the same. The fact that this god is commonly held to be the solar child of Isis and Osiris serves as a convenient veil drawn over the identification with Set. The cult of Osiris was not dominant throughout the two lands of Egypt until relatively late dynastic times. Ra-Mentu, on the other hand, is particular to the ancient Theban cult of Thelema, embodying the attributes of Ra, Horus, Set and Apophis (as serpent) in one image. Study of the hieroglyphics on the obverse and reverse of the Stele demonstrates that Kenneth Grant was not mistaken when he insisted that Liber AL vel Legis, the source book of Thelema, declares the secret doctrine of the cult of Set-Typhon and not the exoteric rites of Isis, Osiris and their child Horus. The birth of Set as the manifesting star of Nuit required no paternal intervention—and that is a key of primordial import. The hedonist revelry of Christmas is all the more bizarre when we consider that its principal icon, Santa, is derived from an obscure Roman Catholic anointed luminary, St Nicholas. Nonetheless, three days after the winter solstice the light is most certainly born into the darkness of the world—though profane humanity neither knows nor cares. Socrates and his modern day adorants prefer the naturalistic explanation of supernatural phenomena, which does not dare contradict the sacred shrine of dogmatic material science. While asceticism demands that visible nature is abhorrent, pre-religious spiritual doctrines assert that visible nature is the form of the formless, a miraculous demonstration of the existence of God. This cannot be proved by argument, persuasion, reason or fact, since the miracle is entirely in the eye of the beholder. While nature is the object here, Esoteric Thelema asserts there are no objects as such and that all worlds of existence arise from pure subjectivity. For that reason, the nature of Set is impossible to pin down, for he is both the pin and the thing pinned; he is the hook, the line and the sinker; the cross (way) and the one crucified; he is the stone of the wise, the stone for stumbling and the one that stumbles. If we look to the Pyramid Texts, we find that the ancient Egyptians, shrewd in such matters, depicted the serpent, cognate with ‘messiah’, going forth on two legs—when everyone knows the serpent is uniquely identified by the fact of having no legs. Thus do we go forth, be it in darkness or light! It is no accident that Saturn is the planetary ruler of two Zodiac signs and not one, though the harmony was not realised by modern astrologers, who wished to align their particular form of black art with profane science. They thus wheeled in the outer planets as new rulers of the double signs, invoking the Lords of Unbalanced Force. 1. In the writings of Kenneth Grant, ‘Saturn is the power behind Venus’. For a magical reappraisal of divine parthenogenesis, and its importance in theurgy, see ‘The Magick of Light’, The Phoenix and other Stellar Rites of Initiation [Ordo Astri]. 2. See Thrice Greatest Hermes: Studies in Hellenistic Theosophy and Gnosis, GRS Mead [Kessinger Books]. 3. See The Flaming Sword Sepher Sephiroth Volume Two [Ordo Astri]. 4. Qabalistically, ‘serpent’ and ‘messiah’ are equal terms, for the Serpent (NChSh) that initiated Eve and the Messiah (MShICh), or ‘anointed one’, both add to the number 358. See The Flaming Sword Sepher Sephiroth [ibid]. 5. Crowley had a better idea of what to do with the outer planets in astrology but his idea was not taken up—it requires Qabalistic knowledge before it can be understood. See Hermetic Astrology [Ordo Astri]. 6. 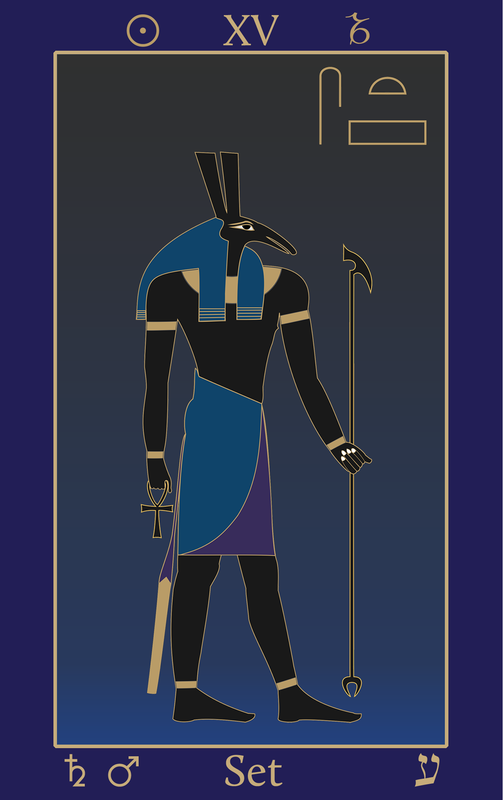 For more on the god Set and the Qabalistic year, see Capricorn: Egyptian Tarot of Thelema Set XV.